We live in the era of change. Every year, we discover and invent new, marvelous things in every possible field. We have developed new fabrics, new agriculture techniques, means of travel, medical procedures and so on and so forth. It seems like we can improve everything, and if not, we create something anew! What a brilliant time to be alive. But it wasn't always like this. In fact, how we live now is a consequence of the Industrial Revolution. Let's see how. Throughout pre-industrial history, people did everything by hand. They helped themselves by using some basic mechanisms and tools, but the bulk of their effort relied on their shoulders. This remained unchanged for centuries. In fact, the lives of English peasants in 1750 was hardly different from the lives of their ancestors! Rural families mixed work with social life, as they lived in small plots of land. They grew crops for home consumption and tended to farm animals with the same purpose. Before the Industrial Revolution, commoners led an agrarian lifestyle. They thought God made humans sick to purify their souls. Pre-industrial folks had no healthcare, no education and no hygiene. They were also dying. A lot. Poverty, war, plague and poor hygiene aided the ever-growing mortality rates among young people. 25% of children died before their first birthday and another 25% perished before they turned 10. Epidemics were abundant and the Black Death killed nearly one-third of the European population between 1348 and 1351. This meant that the population was stagnant, as new people were only making up for those who had died. What today is Germany, for example, only gained three million people between 1300 and 1700. In comparison, the population of the United States grew from 76 million in 1900 to 281 in 2000. Moreover, wealth in pre-industrial Europe was concentrated in the hands of the aristocrats. Everyone else was poor. This meant that for the common English citizen, living before the Industrial revolution, "savings" was a foreign word. Everyone was living on a subsistence level and struggling to make ends' meet. In addition to that, they struggled to give food and pay taxes to the nobility and the clergy, who paid no taxes. In the 13th century people started building cities. Fist in Northern Italy and the in Holland, Belgium and England, rural craftspeople and merchants left their feudal obligations and moved to towns and cities. There, they started producing handcrafted goods and charging clients for their work. Back the, the productive processes were slow. Everything was done by hand, and it took time and considerable effort. Still, the cities thrived and with them came people who started thinking of how to make things easier for everyone. Pre-industrial cities were pioneers in mechanical tinkering, engineering and craft production. These hubs of learning were home to the spark of inventions and innovations that ultimately triggered the Industrial Revolution. The Europeans used the Chinese gunpowder to fire guns and cannons, which enabled them to expand their trade territory. This expansion caused a financial revolution of sorts, which birthed the concept of joint stock companies where stockholders where partial owners. Naturally, these stockholders wanted to further expand their companies. This and other financial and mechanical inventions became the norm in the pre-industrial cities. Along with the Agricultural Revolution, they set the stage for the Industrial Revolution. This movement started in the late 17th century and accelerated through the 18th century. It was marked by an increase in food production in England, a country with a historically poor diet. During the Agricultural Revolution, new agricultural techniques facilitated food production and helped feed the growing population. This period created a surplus of labor, which was useful in meeting the needs of the rising industrial cities. It also resulted in prosperity for the land-owners. More varied crops lead to stronger and healthier farm animals, which replenished the soil with nitrogen and preserved the land's fertility. More varied crops. The Agricutural Revolution was possible because of the crops coming in from the New World. Items like corn, potato, turkey, squash and tomate became food staples in the Old World. Crop rotation. Before this invention, people all around Europe left their fields unplanted for one year, in order to not deplete the soil. The Dutch discovered that rotating wheat, turnip, barley and clover in the same field on a four-year rotation replenished the nitrogen in the soil, which increased its productivity. The Enclosure Movement and Jethro Tull. During the Agricultural Revolution, pastures and forests stopped being shared and instead were enclosed. This allowed land-owners to experiment with their fields. A brilliant invention by Jethro Tull was the seed drill, which placed seeds in the soil at the right depth and distance. This resulted in less wasted seeds and higher yields. It was a transformative period which took place between the 18th and 19th centuries. The Industrial Revolution marked a shift from an agrarian lifestyle to a modern, industrial one. The latter was defined by the transition from hand production methods to machines, new chemical manufacturing and improved efficiency of water and steam power. It is a method of manufacturing using machinery and division of labor. Before the Industrial Revolution, the putting-out system —or cottage industry— was the norm. In this working method, merchant capitalists provided agricultural laborers with raw materials and picked up the finished goods. The merchants paid the laborers by the piece and resold the merchandise for a profit. With the advent of the Industrial Revolution, some early machinery was available to the agricultural laborers. However, as new, more expensive inventions appeared in the market, they were no longer able to afford them. This gave rise to capitalist ownership of factories, with many of the former craftsmen becoming factory workers out of necessity. The use of machinery and the division of labor reduced the required skill level of workers and increased productivity. At the time, the factory system gave way for the exploitation of the laborers. Many rural folks were displaced from their villages after losing their jobs in the cottage industry and their lands due to the enclosure. The demand for work was higher than the offer and factory-owners benefited from this to hire cheap labor in atrocious working conditions. According to Alice Clark, the expansion of capitalism in the 17th century took away women's economic importance within the household. Prior to the Industrial Revolution, women played active roles in running farms and in some trades and landed states. This gave them a sense of equality with their husbands. With the start of the Industrial Revolution, however, women were relegated to unpaid household work and lost most of their power. Ivy Pinchbeck, in turn, argues that capitalism set the stage for women's emancipation. In regards to the family, the Industria Revolution brought about significant change. Families went from subsistence farming to the "family wage economy" of early industrialization, where the parents and older children worked to support the family. Later on, the "family consumer economy" developed and women sought jobs to support their families' rising consumption standards. During the Industrial Revolution, the quality of life of those at the bottom of the social structure declined dramatically. For craftspeople, a previously well-off sector of the population, the advent of industrialization threw them into poverty. They had to seek jobs at the factories, where their skills were practically useless. In general, people working at the factories led a miserable life. The money was scarced and factory workers had no rest. Working-class people had no time or oportunity for recreation, they spent all day at work and were exhausted when they came home. These workers could no longer go back to their villages for the local festivals or to harvest their crops, for fear of losing their jobs. Furthermore, the neighborhoods of working-class families were no more than shanty towns. They had narrow roads with no sidewalks and no sewage system or sanitary facilities. These neighborhoods were densely populated and diseases were the norm. However, the poorest of the poor had it worse than everyone else. These people were torn between two choices: starvation and the poorhouses, which were prison-like establishments for those who depended on welfare. Poorhouses were harsh places which discouraged people from using welfare. Families were separated from the moment they stepped in the poorhouses and were forced to work every day. Malnutrition was the norm in pre-industrial Europe. Later on, with the Agricultural Revolution, food production increased and so did the population. This strained foods and other resources until industrialization came around. During the Industrial Revolution, new transportation methods —such as canals and roads—appeared, which lowered food costs. The later decreased further when the railroads came along. The Industrial Revolution gave birth to a middle class of professionals, such as lawyers and doctors, who lived in much better conditions than the factory workers. The middle class families could afford cooks and house maids. They also belieed that their professional success was the result of their energy, perseverance and hard work. The middle class separated their work life from their family life. The women of the house did not work outside the house. Instead, they stayed at home and ensured the house was a sanctuary for their husbands to disconnect from the industrial world. This sector of the population could also afford to send their kids off to school and started to have fewer children as better healthcare became available. The population of England doubled during the Industrial Revolution. Europe as a whole experienced a population growth of 300 million between 1700 and 1900. The Industrial Revolution was the first period in population and per capita income increased in parallel. The factory system contributed to the growth of urban areas. Large numbers of workers migrated from the country into the cities in search for work in these factories. Manchester, which was the first industrial city, experienced a six-time increase in its population between 1771 and 1831. Bradford, another industrial city, grew 50% every ten years between 1811 and 1851. That year, only 50% of Bradford's inhabitants had actually been born there. Being a child was not much fun during the Industrial Revolution. Infant deaths decreased dramatically during this period, but surviving childhood was still an uphill battle. Education was expensive and out of reach for children of the working class, who worked to help support their families. Some machines in the factories did not require any skills to operate, and children became the labour of choice for manufacturing. In fact, in England and Scotlad in 1788, two-thirds of the workers in the cotton mills were children. 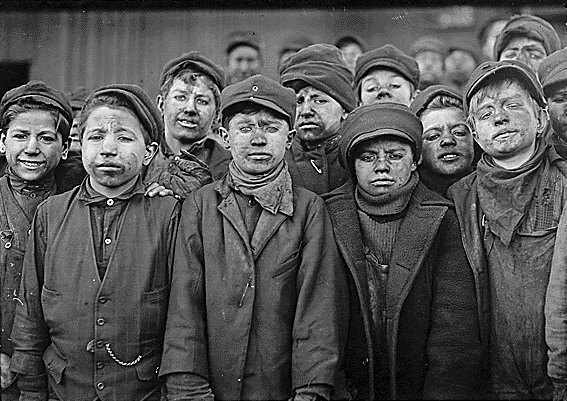 Factory owners forced children to work in awful conditions and for a much lower wage than their elders. They employed children as young as four years old, who usually worked from 4 am to 5 pm. In time, several reports describing the abuses came to the surface and popularized the children's plight. This cause was supported by the upper and middle classes, who pushed for the children's welfare. Finally, Britain passed the first general laws against chld labour in 1833 and 1844. Law enforcement was very poor until the government banned women and children from working in the mines. However, child labourers remained in Europe and the U.S. until the 20th century. The Industrial Revolution concentrated laborers in mills, factories and mines and facilitated the organization of combinations or trade unions, which pushed for the laborers' rights. Unions could demand and get better terms by withdrawing the entirety of the labor force and thus stopping production. The factory owners then had to comply or face the cost of the production losses. Working people also formed co-operative societies to help each other in times of economic turmoil. While heavily restricted, by law and in practive, by the factory makers and the governments, unions slowly overcame the legal restriction on the right to strike. Later on, effective political organization for working people was achieved through the trade unions that began supporting socialist political parties. During the Industrial Revolution, the levels of smoke and pollution in the atmosphere resulted in the appearance of the environmental movement. The construction of bigger and bigger factories led way to a rapid increase in coal consumption, which heavily polluted the air in industrial centers. This, in addition to the growing volumes of industrial chemical discharges and untreated human waste created an environmental and public health emergency. Britain released its first large-scale, modern environmental law in the form of 1863's Alkali Acts. This law sought to regulate air pollution coming from the Leblanc process and resulted in a 1958 act which put heavy industries that emitted smoke, grit, dust and fumes under supervision. During the Industrial Revolution, there was a surge of grassroots movements to demand and achieve environmental reforms in industrial cities. These movements achieved, among other thing, the Public Health Act of 1875, which required that all furnaces and fieplaces consume their own smoke. Policy makers later expanded this law to include other harmful emissions.